The sea and environment surrounding Iona is of world class. It is unique, extraordinarily rich in its bio-diversity and very beautiful. It is infinitely precious. There is a proposal to establish a large fish farm in the seas by Gometra ( a wee island seven miles north of Iona and two or three from Staffa) and the negative environmental impact will be considerable. There are already several fish farms around Mull and The Scottish Environmental Protection Agency (SEPA) recorded that in Loch Tuath alone (2010 figures) 2.6 tonnes of toxic copper and some 123 tonnes of organic carbon were released into what until recently was a relatively pristine sea. -the deployment of ‘acoustic deterrents’, which by causing pain to their hearing systems is intended to exclude whales, dolphins and porpoises over a large area. -the application for further licenses to kill seals -which are already in sharp decline due in part to existing ‘kill’ licenses held by fish farms. 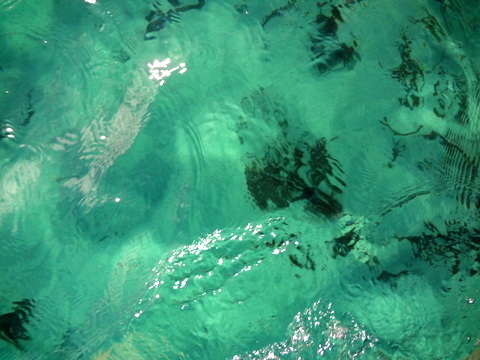 -the pollution of the sea by large quantities of fish faeces and fish meal being poured, untreated into the waters. To quote Roc Sandford of Gometra: ‘The days of industrial scale pollution are numbered… a pig or dairy farmer whose operation wilfully polluted the sea to a similar extent would “go straight to Goal without passing Go” ‘. As I said in a previous blog,the sea is still our ‘dustbin’. -sea-lice: resistence to medication for sea-lice is developing and there is evidence of mass shell-fish die-offs in the vicinity of salmon farms during sea-lice treatments. -escapes. Escaped farmed salmon are known to breed with local, wild, salmon stocks, outcompeting them and compromising the viability of the wild stock. Wild salmon populations have already and correspondingly collapsed since salmon farming arrived in Loch Tuath. -visual pollution. 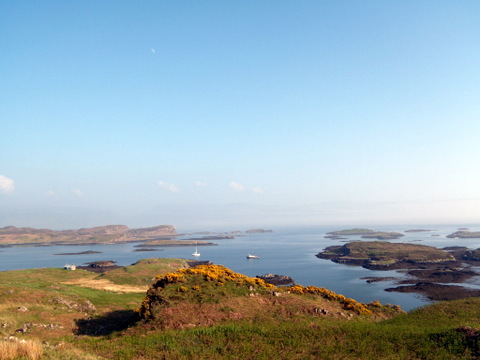 The economy of Mull and Iona is largely based on environmental and wildlife tourism. The cages and infrastructure are highly visible ( being on the water and often in pristine areas of coastline) and cannot but diminish the quality of visit for our guests who come precisely for the pristine quality of our landscape. The selling point, is of course, jobs (Four full time jobs to be created). However, this is questionable. As an international company, profits from ventures such as this will not remain in Scotland (far less Mull) and statistics show that actual job numbers in fish farming are dropping in large part due to automation and efficiencies. According to Scottish Government figures, full-time employement in sea cage salmon production is currently around 900 (across Scotland) after a peak of some 2000 several years ago. There are certainly a lot of fish farm jobs on Mull and it is a valued part of the social fabric and economy. I appreciate just how important this is. I’m not against fish farms, per se, but do question the development of this new, large fish farm under the banner of ‘creating jobs’ when the arguments against it are so convincing. I’m sure that an independent socio-economic study would show that there is as great or greater job potential in the booming eco / wildlife tourism market than in what is, at the end of the day, a polluting, industrial plant imposed upon a pristine environment. Mull Community Council has strongly condemned these plans as being entirely unsuitable on environmental grounds. If you would like to find out more or feel that you would like to put your name to a petition opposing these plans, please visit www.thepetitionsite.com/1/savestaffaarchipelago . Several years ago Michele and I were out at the mouth of Loch Tuath in our boat. The air held perfectly still, the sea was calm and the sky and the buttress of the Burg pulsed pinks and greens as the sun settled over Staffa. Around us, three Minke whales circled, having a last snack of fish, I suppose, before the darkness fell. It was magical and never to be forgotten. If the plan gets the go ahead, audio deterrence, pollution and disruption will make this a thing of the past. The whales won’t come here anymore. Thanks for making me aware of this-I’ll circulate the details to everyone I can think of. Great blog! There is also a proposal for a fish farm below the Burg. I’m arranging a community council meeting asap to discuss these proposals and come up with a response. If you google ‘proposed fish farm, Armeanach, Mull’ you’ll find another petition to sign, organised by someone on Mull.